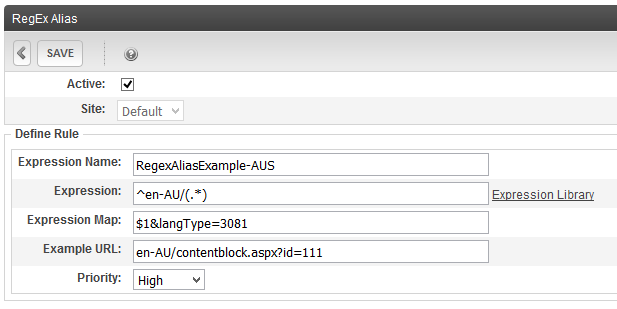 You can leverage Regex to create automatic aliasing within the the CMS. Below is a sample of how to create a regex aliasing rule that redirects to a specific language of the content when the en-AU/ value is entered into the URL of the site. This lets a user enter a specific language identifier, as opposed to adding the appropriate langtype value into the URL. After adding this aliasing rule, enter the URL of SiteRoot/en-AU/TemplateName?id=x to resolve to content item with an Australian English language.